"This is pitiful. A thousand people, freezing their butts off, waiting to worship a rat! What a hype. Well they used to mean something in this town, they used to pull the hog out and they used to eat it. You're hypocrites! All of ya! You got a problem with what I'm saying, Larry? Untie your tongue and you come out here and talk, huh? Am I upsetting you, Princess? You know you want a prediction about the weather, you're asking the wrong Phil. I'll give you a prediction. It's gonna be cold, it's gonna be gray, and it's gonna last you the rest of your life." ~~ Bill Murray , American actor and comedian, as quoted in the 1993 critically acclaimed film "Groundhog Day"
It’s that time of year again, when a funny furry fortune-teller comes out and predicts six more weeks of winter if he casts a shadow – if no shadow, early spring is here. Occurring every year on February 2nd, dates for the entire celebration begin February 1st - February 3rd, and Punxsy Phil will predict what the next 6 weeks of weather will be. Amazingly, for over two centuries, (1886 or earlier) crowds as large as 40,000 have gathered at Gobbler's Knob hill at Punxsutawney, Pennsylvania to celebrate. Other celebrations taking place in Pennsylvania include Quarryville in Lancaster County, the Anthracite Region of Schuylkill County, and Bucks County. 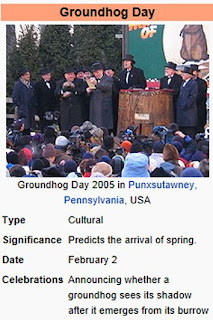 The largest Groundhog Day celebration is held in Punxsutawney, Pennsylvania. Groundhog Day received more mass attention after the release of the 1993 comedy film “Groundhog Day,” starring Bill Murray who plays Phil Connors, an egotistical Pittsburgh TV weatherman who, during a hated assignment covering the annual Groundhog Day event in Punxsutawney, dreams living February 2nd over and over while repeatedly indulging in hedonism and numerous suicide attempts. Finally he wakes up and realizes his life matters and prioritizes and makes drastic changes and improvements. In 2006, the film was added to the United States National Film Registry as being deemed "culturally, historically, or aesthetically significant." Many wonder just how scientific is Punxsy Phil's shadow. According to groundhogday.org, the furry fortune teller is accurate 75% to 90% of the time, while a Canadian study of 13 states has the success rate at 37% and the National Climatic Data Center (NCDC) has the overall prediction rate at 39% accurate (since 1987). The Stormfax Weather Almanac reports Punxsutawney Phil has seen his shadow 100 times, no shadow 16 times with no record 9 times. 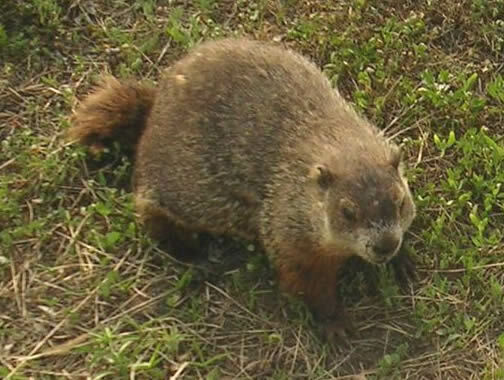 Groundhog day in Staten Island is sponsored by Time Warner Cable and garnered with trumpets to wake up the little Staten Island's very own woodchuck, "Chuck," as the Staten Island Zoo opens its gates at 6:30 a.m. on Feb. 2. Also South Carolina has Sir Walter Wally. Staten Island Chuck, or Charles G. Hogg as he is known in formal company, will make his prediction at 7:30 a.m. and the ceremony is free. What do you think? Do you believe in the science or spirit of Groundhog Day? Wow, and Punxsutarney Phil didn’t case a shadow on such a sunny day. And he predicts an early spring all while we’re getting snow! Figure that. Lol, so much for the science of the shadow. Really like this post, and thanks for letting me know about the film, I can’t wait to rent the video. How did I miss this one? For sure, the spirit of this event is what matters. Groundhog Day is really a cultural phenomenon in America and around the world. Although Punxsutawney Phil is our local and has a poor prediction success rate. As per your question, I enjoy the fun and spirit of this popular event, not the science of it. Great that NYC has Chucky of the Staten Island Zoo. I am amazed that no shadow was cast and an early Spring is predicted all during snowfall. Let’s see if Punxsy Phil is correct this year. So much for the science in Punxsy Phil’s shadow. Hoorah for GroundHog day, really enjoyed your tribute with this enjoyable post. I read this and thought, how cute are these woodchucks and how nice to be reminded of GroundHog Day. Re your question, it’s not about the science but all about the fun and spirit of this cultural event. Delightful insight about GroundHog Day. Thanks! Amazing how this is such a popular event even though Phil’s prediction rate is so poor. Goes to show you the spirit of the event is more important than the science. In answering your question, of course, it’s the spirit of the event, not at all the science of predictions. Lol that Punxsy has only an average 39% prediction success rate.